Energy efficiency represents one of the main challenges in the engineering field, i.e., by means of decreasing the energy consumption due to a better design minimising the energy losses. This is particularly true in real world processes in the industry or in business, where the elements involved generate data full of noise and biases. In other fields as lighting control systems, the emergence of new technologies, as the Ambient Intelligence can be, degrades the quality data introducing linguistic values. The presence of low quality data in Lighting Control Systems is introduced through an experimentation step, in order to realise the improvement in energy efficiency that its of managing could afford. 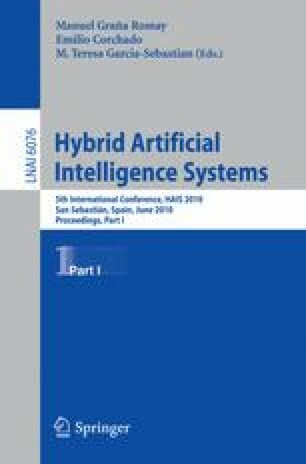 In this contribution we propose, as a future work, the use of the novel genetic fuzzy system approach to obtain classifiers and models able to deal with the above mentioned problems. This research work is been funded by Gonzalez Soriano, S.A. by means of the the CN-08-028-IE07-60 FICYT research project and by Spanish M. of Science and Technology, under the grant TIN2008-06681-C06-04.